Ceramic Bamboo branches to be perfumed.Dimension: L17 cm x W 11 cmMaterial: Acacia wood and ceramic .. Ceramic flower to be perfumed.Dimension: L17 cm x W 11 cmMaterial: Acacia wood and ceramic flower.Fl.. Ceramic flower to be perfumed with essential oil or home perfume.Diameter: 7 cm. Height 6 cmMaterial.. Ceramic flower to be perfumed.Diameter: 10 cm. Height 7 cmMaterial: Acacia wood and ceramic flower.J.. Ceramic flower to be perfumed.Diameter: 7 cm. Height 6 cmMaterial: Acacia wood and ceramic flower.Ja.. Ceramic flower to be perfumed.Diameter: 7 cm. 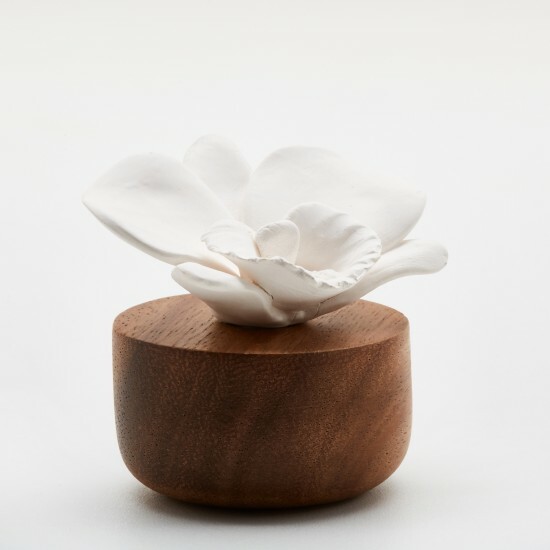 Height 6 cmMaterial: Acacia wood and ceramic flower.Or.. Ceramic flower to be perfumed.Diameter: 7 cm. Height 6 cmMaterial: Acacia wood and ceramic flower.Ro.. Ceramic flower to be perfumed.Diameter: 7 cm. Height 6 cmMaterial: Acacia wood and ceramic flower.Oe.. Burning time: about 40 hours. Lacquered glass.. Total weight﻿: 450 grs﻿ F.. Burning time: about 40 hours. Lacquered glass.. Total weight﻿: 450 grs.﻿ ..
Candle wick trimmer. Stainless steel - gold 18 cm long..
Room Spray 100 ml Accor Audacieux. Glass bottle. An enveloping fragrance is pres..
Room Spray 100 ml Absolute. Glass bottle. Cubic shape.An enveloping fragrance is pres..
Room Spray 100 ml Ambre & Douceur. Glass bottle. An enveloping fragrance is ..